Kennedy, Midler say disagreeing with health care plans could lead to civil war. If so, wouldn’t those agitating for change be responsible? Stanley Kurtz, perhaps the most dogged investigator of President Obama’s checkered past, recalls to mind Mr. Obama’s past association with ACORN. It’s not pretty, but it ought to be required reading for those who persist in providing the president with the cover of “moderate” and “mainstream” labels. There’s been a good deal of attention to ACORN of late, and deservedly so. Yet for all the fuss, what is arguably the most important Obama-ACORN tie of all has gotten short shrift. During the 2008 election, Obama’s close links to the far-left New Party were revealed and explored (although not by the mainstream press). Yet many seem to have forgotten that the New Party, particularly in Chicago, was dominated by ACORN (and by an ACORN-controlled SEIU union local). During the campaign, I detailed Obama’s New Party ties in two pieces, “Something New Here,” and “Life of the New Party.” Important evidence of Obama’s pursuit of the New Party endorsement can also be found in the September-October 1995 issue of “New Ground,” newsletter of the Chicago chapter of the Democratic Socialists of America. Obama’s New Party ties matter because they show that his links to ACORN went far beyond shared on-the-ground organizing, legal representation, training, or even funding (although all of those ties existed and were important). By running for office with the New Party, Obama was effectively indicating that he shared ACORN’s radical political goals. And the list goes on. We should bear Stanley Kurtz’s missives in mind when considering our votes in 2010’s mid-term elections. A destructive force like President Obama must be countered by a skeptical, determined opposition to ensure that mainstream Americans’ rights and lives are protected. The idea is that free labor is the essence of Americanism. Hard-working ordinary people, who create wealth in material ways, are the moral backbone of the country. In this free, capitalist nation, people should be held responsible for their own output. Money should not be redistributed to those who do not work, and it should not be sucked off by condescending, manipulative elites. I couldn’t have said it better myself. And I truly mean that. Dear Moslem Association: As a professor of Mechanical Engineering here at MSU I intend to protest your protest. I am offended not by cartoons, but by more mundane things like beheadings of civilians, cowardly attacks on public buildings, suicide murders, murders of Catholic priests (the latest in Turkey! ), burnings of Christian churches, the continued persecution of Coptic Christians in Egypt, the imposition of Sharia law on non-Muslims, the rapes of Scandinavian girls and women (called “whores” in your culture), the murder of film directors in Holland, and the rioting and looting in Paris France. 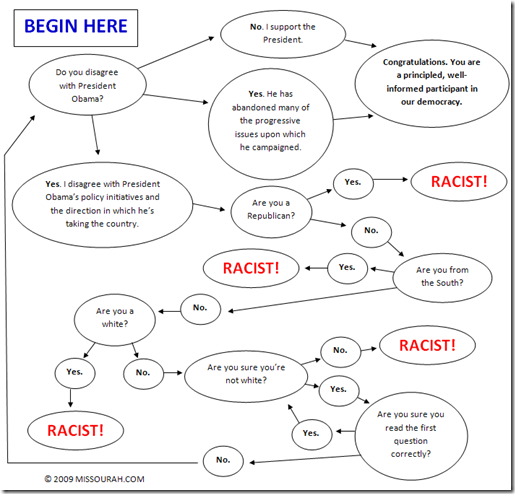 This is what offends me, a soft-spoken person and academic, and many, many, many of my colleagues. I counsel you dissatisfied, aggressive, brutal, and uncivilized slave-trading Moslems to be very aware of this as you proceed with your infantile “protests.” If you do not like the values of the West–see the 1st Amendment–you are free to leave. I hope for God’s sake that most of you choose that option. Please return to your ancestral homelands and build them up yourselves instead of troubling Americans. Cordially, I. S. Wichman, Professor of Mechanical Engineering. Predictably, Wichman’s letter was followed by the expected coercion and legal threats against his free speech rights and his career. I’d like to agree, but I cannot. It’s important to realize that the Muslim groups’ actions, while cowardly, do not originate in cowardice. Rather, these strident demands for special treatment are carefully designed strategies intended to force outcomes favoring their special interests at the expense of ordinary Americans, including true heroes like Dr. Wichman. It is therefore imperative that these groups be resisted at every turn, including the legal and electoral: Exercise your right to free speech, even when it’s inconvenient; refuse to let your jury give in to un-American demands; vote for judges and representatives who will uphold the existing rules of law, common sense, and American values; at all times remain vigilant in your defense of the American way of life. ACORN, the activist organization accused of voter fraud in the 2008 presidential election and various other unsavory deeds, is now suing the reporters who exposed some of the group’s outrageous actions. Since when did telling the truth about a group dedicated to defrauding the American people become a crime? 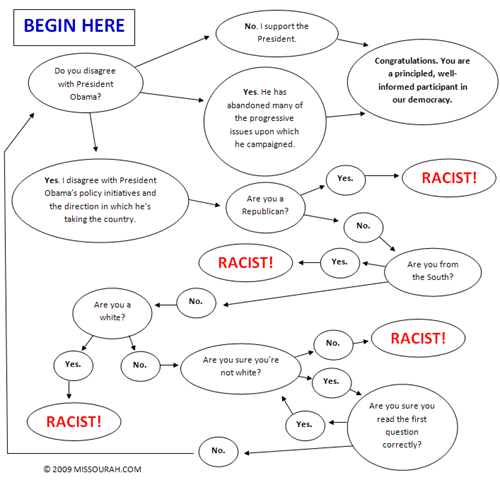 Missourah’s take on the whole “if you dare to disagree with President Obama then you’re a racist” shtick that defines the Democrats these days would be a riot if it weren’t mostly true. Matt, tell the black lady who headed up our communities’ tea part all about your accusations of racism at the core of the resistance to Obama. I’d pay to watch her laugh at you. That, my friend, is rational, inclusive thinking of the sort that liberals would be well-advised to attempt to undertake. Should be fun to watch his readers come unglued in response. Nevertheless, there was something truly inspiring about watching this black, American lady (whose name escapes me at the moment) get up on stage and make this statement. I wish that Jesse Jackson and Al Sharpton had been there to witness her putting them to shame. 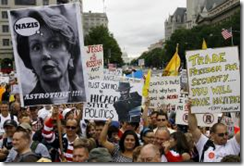 The streets of Washington D.C. are filled with citizens who want President Obama and the Democratic leadership to reconsider the massive government-sponsored reorganization of the nation’s healthcare system. These protesters, many of them politically involved for the first time in their lives, have come from across the nation with a purpose: to let the federal government know that they do not want any further expansion of federal authority or spending, particularly in the sensitive area of personal health. Some liberals in Congress and in the media are still trying to spin this massive protest against the left wing’s agenda as artificial, “astroturf-ed” into existence by Big Business and rich Republican fat cats. Nothing could be further from the truth.